The West Canada Creek By Matt Chapple Black Angora Stonefly Nymph “When the water receded to 200 cfs around 5pm March 19th, I landed two beauties(one around 18″) in the trophy section using #6 black stoneflies fished at the head of a pool. Sunset was around 6:30pm.” Matt ChappleThe lower portion of the West Canada from Trenton Falls flowing south through a picturesque valley to the Mohawk River at Herkimer is one of Central New York’s premier trout streams.It offers everything a fly-fisher could dream. It has deep pools, long runs, classic riffle water, large brown trout, and excellent aquatic insect populations. There is also a year round fishery now. The section from Trenton falls to the bridge at route 28 is open year round, catch and release and only artificial lures may be used.The West Canada has excellent populations of stoneflies. During the winter months, fishing stonefly nymphs sizes #6 to #12 will produce fish. Hatches of caddis and mayflies start in the spring and continue throughout the summer and into the fall. Hatches start with some Quill Gordons (Epeorus pleuralis) in April, but the hatches become heavier in May with the emergence of the Hendricksons (Ephemerella subvaria). 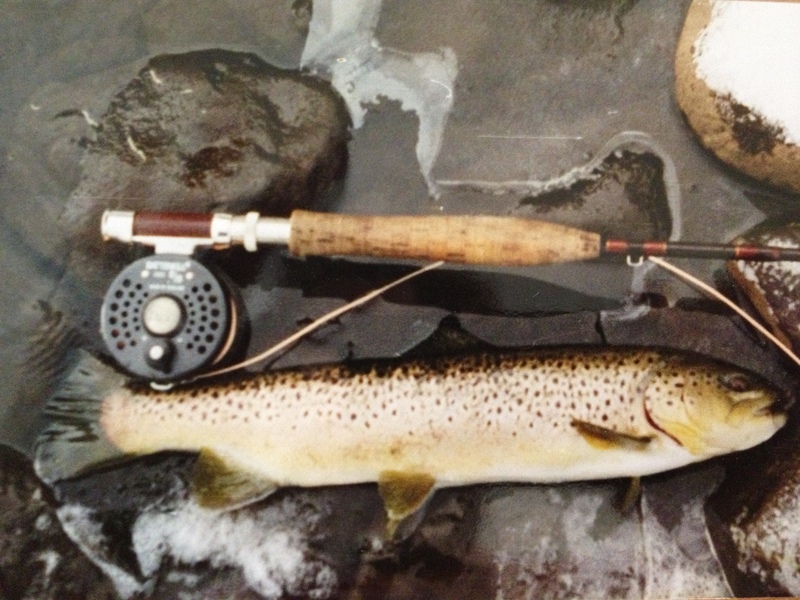 There are a variety of mayfly hatches and nice caddis hatches throughout the season well into the autumn, so be prepared with Elk Hair Caddis with green, tan, or gray bodies as well as Caddis emergers and pupa which are effective patterns at times when fish selectively feed on ascending caddis. Comparaduns and sparkle duns are good patterns for the slick long pools during mayfly hatches. Some other exciting hatches are the Golden Drakes (Potamanthus distinctus) in July, the White Fly (Ephoron leukon) in August and September, and Blue Winged Olives (Ephemerella attenuata) in the autumn. When fish are not surface feeding, nymphs and streamers will also take fish. I have taken my biggest fish fishing nymphs on the West Canada. Prince Nymphs, Stonefly imitations, Woolly Buggers, and streamers with a touch of yellow or chartreuse can be effective. 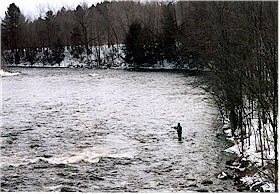 The portion from Trenton Falls to where it first passes under Route 28 is the year round artificial only section and is open to fishing all year. The West Canada, one of Central New York’s premier trout streams, continues flowing south through a picturesque valley to the Mohawk River at Herkimer. The season opens on the rest of the creek from the Route 28 bridge to Herkimer on April first and lasts through November 30th. Always consult the New York State Regulations Guide for seasons on all New York’s rivers and streams.